Magento is already one of the most SEO friendly e-commerce platforms available, but as you should know by now, there are always ways of making improvements. Here we will provide our top tips for improving the SEO of your Magento website. Why is Magento SEO important? If you want your Magento website to rank well on relevant search engine results pages, you need to improve it’s SEO. The better your Magento website’s SEO is, the more likely it will be to rank higher on SERPs. The higher your website ranks, the more people will click on your link, giving you a greater chance of increasing your conversion rates. As you can see, improving your website’s SEO will prove to be very beneficial for your business. Want your products to show up in search results? You will need to make sure your Magento ecommerce store is fully optimised. It is important to make sure that you update the default meta data for your Magento ecommerce store. Using the same meta data for all pages will result in your products displaying the wrong descriptions on SERPs. Updating your meta data will ensure that the description is relevant to the searched keyword and is more likely to convince users to click through to your page. whole site. To set your title and meta data on a page by page basis, go to the individual categories and product pages in your catalogue section of the admin panel. The descriptions you write should feature relevant keywords for your categories, products and services. This will help search engines match the keywords users input to your product links. As well as creating customised descriptions for your meta data, you will also need to make sure you edit your image file names when you upload them. By including keywords, you will stand a better chance at your images showing up on Google Images and Google Shopping. Changing your Magento SEO product descriptions can be incredibly beneficial in helping your site rank. Your products need to contain the search keywords you are looking to optimise. If you are uploading multiple products using the names and descriptions as your suppliers, you need to make sure they are customised to include the important keywords. The same rules should apply for your Magento category names and descriptions. It is not just your text and URLs that you can optimise for SEO, but images too. Every time you upload an image to your Magento website, whether it is for a category page or product page, it is important that you optimise it correctly. This involves making sure that the image has an appropriate title that search engines what if features. You should also create a suitable title for your images’ alt tags. The best way to write an image alt tag is to write it as if you were explaining to a visually impaired person what the image features. Optimising your Magento website’s images will help them to rank in Google images and drive more traffic through to your ecommerce website. We all know that duplicate content is a big SEO faux pas. A great way to help search engines understand your Magento SEO duplicate product pages is to suggest the preferred version of the URL for each page. You can do this by installing the Canonical URL’s for Magento module and using the canonical URL tag ‘rel=canonical’. It is important to make sure that search engines are focusing on the relevant sections of your Magento site. You do not need them to crawl and index the ‘login, ‘cart’ and ‘checkout’ pages of your site. One of the easiest ways to prevent them from doing this is to stop linking to non-content pages. Although there isn’t currently a module that can do this for you, you can go to your template files and add the “no follow” tag to these links. Another way to improve your Magento websites SEO is to add pages to the content management system and fill them with well-written, keyword-rich content. The pages you create should have value to your customers, for example you may want to create a product guide providing information about how to use your products. You could even vary your content by embedding a ‘how-to’ video. Presenting your company as an expert in the industry will show Google and other search engines that you have authority and may have an impact on your ranking. Search engines also greatly value user-generated content. This can be added to your Magento site in the form of product reviews from your customers. Magento has a built-in review system, but there are also various modules you can integrate for better functionality. Not only do product reviews benefit your ecommerce website in terms of SEO, but they will also encourage other customers to make purchases. As we mentioned before, the creation of unique, relevant and engaging content can greatly benefit your websites SEO. As well as creating informational pages for your Magento site, you may also want to consider setting up a blog. Whilst Magento does not have blog functionality as a core function, there are several Magento modules that can be integrated with your ecommerce store so you can make use of a blog. Some of the most popular ones include ‘Blog,’ and ‘nBlog’ both of which are free to download. 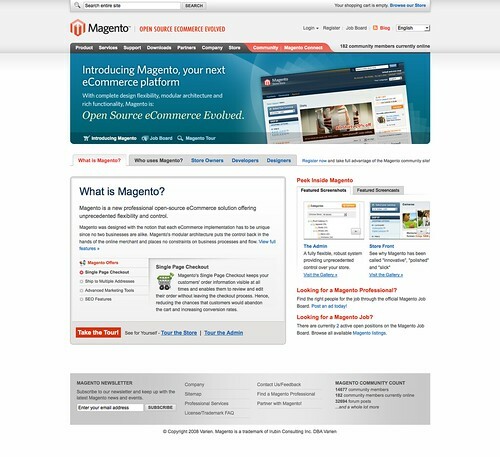 One of the easiest ways to optimise your Magento website is to download the SEOgento Magento SEO extension. This module will enable you to create titles, meta tags, canonical URLS, whilst also letting you rewrite layered navigation on category filters and rewrite meta tags. Guest blogging on a high authority website that is part of the same industry or shares the same target audience as you will prove to be a golden opportunity that will help to improve your Magento website’s SEO. Off site SEO that generates backlinks to your Magento website is every bit as important as optimising your on-site elements. One of the best ways to build natural and ethical back links to your Magento website is to guest blog on other relevant, high authority blogs. Getting a link from a high authority website will pass page rank (link juice) to your website and will help you to increase your search engine rankings. In order to secure a guest blogging spot on another website, you are going to need to write interesting and engaging content that will be valuable to its audience. Seeing as you are likely to share the same audience as the website you are guest blogging on, this shouldn’t be too difficult! engines, they may help your site get indexed faster. Basically creating XML Sitemaps will let search engines know where to look for your content. You can create an XML Sitemap by going to ‘Catalog,’ clicking on ‘Google Sitemap’ and then ‘Add Sitemap.’ Choose a filename, path and storeview, then press ‘Save and Generate.’ Pop the code into your ‘robots.txt’ file. Keep in mind that as you add new products and your inventory changes, you will need to re-generate your XML sitemaps. Although Magento is already an SEO friendly platform, applying the tips mentioned in this article will further enhance your store, helping it to rank in relevant searches. Carry out the tips mentioned in this article and your Magento site will be on its way to being a whole lot more SEO friendly. The more SEO friendly your ecommerce store is, the more likely it is to rank well in relevant searches.